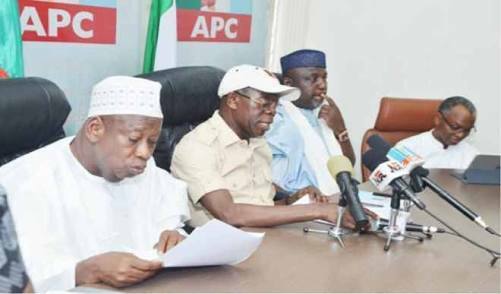 APC Dares INEC: "We Must Present Candidates In Zamfara"
The Independent National Electoral Commission and the All Progressives Congress on Wednesday clashed over the primaries of the APC in Zamfara State. INEC had, in a letter, said that it would not allow the APC to field candidates in any election in Zamfara state. But the APC has insisted that it would field candidates. INEC, in the letter, which was signed by its acting Secretary, Okechukwu Ndeche, and addressed to the National Chairman of the APC, Adams Oshiomhole, explained that its decision was hinged on the fact that the APC failed to conduct primaries for National Assembly, governorship and state assembly, adding that the October 7, 2018 deadline had lapsed. But the APC, in Oshiomhole’s reply to the letter by INEC’s letter, faulted the electoral commission. Oshiomhole said the grounds upon which INEC based its conclusion was faulty and as such could not be relied upon to deny the APC the opportunity to present candidates. He said the party held primary elections for the said positions and that the APC electoral committee sent to the state to conduct the exercise had submitted a comprehensive report. He said, “The summary of the report, as you will find, is that following the high level of friction, disagreements and threatened violence by various political camps before the primaries, all the aspirants met at City King Hotel, Gusau, to find a truce. The APC said it was perplexed that INEC did not wait for it to submit the names of its candidates in Zamfara State “considering that the time within which such submission should take place has not elapsed” before raising its observation in the letter under reference. The APC noted that the Peoples Democratic Party did not also hold primaries in Kano, but no such letter was written to the PDP in relation to Kano State. The two persons at the centre of the crisis are Governor Abdulaziz Yari, who is also a senatorial aspirant, and Senator Kabiru Marafa, who is a governorship aspirant. While Yari wanted his Commissioner for Finance, Mukhtar Idris, to succeed him, Marafa insisted that there must be a level playing field. This led to the conduct of parallel primaries across the state which produced different candidates. The National Working Committee led by Oshiomhole subsequently suspended the state executive of the party to allow for a rancour-free exercise, a decision which did not go down well with Yari. The PDP and civil rights groups supported INEC on its stand on the Zamfara State governorship and legislative primaries. The PDP called on the electoral commission not to allow the APC to intimidate it over its position. It called on the commission not to bend the rules in favour of the APC, warning that doing so would amount to an illegality. The National Publicity Secretary of the party, Kola Ologbondiyan, gave the party’s position at a press conference in Abuja on Wednesday. He said, “Our position has not changed. You remember that after our national convention, we alerted the nation that the closing date for primaries and congresses was October 7, and as of that day, the Zamfara State chapter of the All Progressives Congress had not held a singular congress to elect candidates into various positions that will be contested in 2019 general elections. “We warn INEC because we are aware of underhand measures and moves by the leadership of the APC who summoned the INEC chairman and the Governor of Zamfara State to a meeting.